Chalet Adriana in Siusi in a unique and very sunny location. It is to detail renovated with love Chalet. Enjoy the unforgettable and breathtaking views in the heart of the World Heritage of the Dolomites, the peaceful and unforgettable atmosphere at the foot of the Sciliar, the landscaped garden and the family environment. This chalet is a spacious living room with direct access to the landscaped garden overlooking the Schlern, a fully equipped kitchen and a new bathroom with shower / WC. On the first floor there are two bedrooms with sunny balcony, a bathroom with shower / WC and a small storage room with washing machine. Seis is a small village in the municipality of Castelrotto, the home town of Kastel Spatzen. 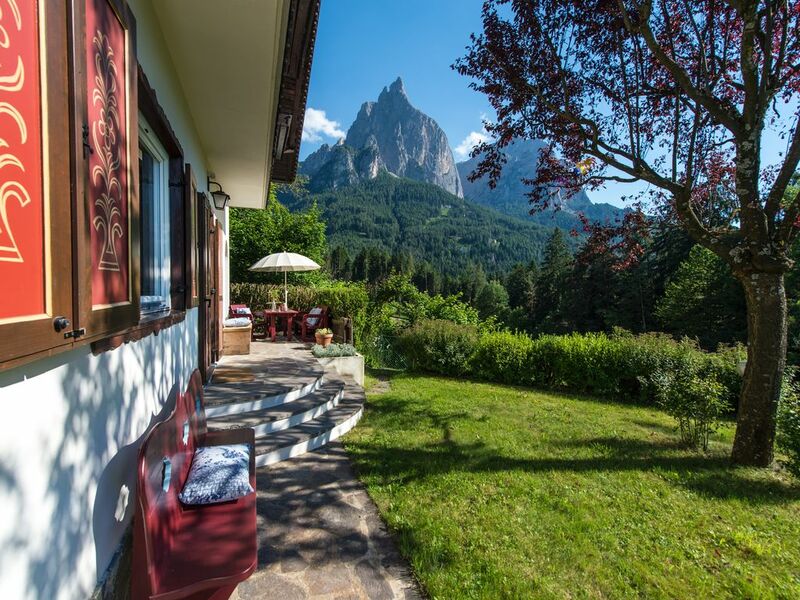 Especially interesting and convenient is the easy and quick access to the orbit of the Seiseralm, the largest mountain plateau in Europe amidst the nature park Schlern-Rosengarten and Sella Ronda Val Gardena. The orbit can, if desired, be reached on foot or by shuttle service in less than 10 minutes. Also conveniently and quickly reach the bus stops, from where you can take the public bus to Bolzano and Bressanone to a leisurely stroll. Seis also offers an 18 hole large golf course, restaurants and shops, all within walking distance. The variety of opportunities for hiking, sledding tours and skiing and cross country trips is limitless and unique, and everything can be done without a car. Superb location, outstanding accommodation, great host! House at the end of a quiet cul-de-sac with a spectacular view of the Dolomites. Waking up in the morning to watch at sunrise and then enjoying local vinho on the veranda in the evening sunset was a great way to begin and end the day. House well maintained with good facilities. Great for family or two couples. Everything in easy access, whether a walk into town, catching a bus almost directly outside the house, with the cable car station in walking distance (for the energetic), or by car or bus. Region well served by bus services, almost do not need a car most the time, lots of restaurants and the choice of hiking trails in the area are amazing from the easy to the very tough. Found everyone we met and spoke to very friendly and helpful. Judith was very organised and attentive and provided a helpful overview of just everything and anything you could think of when we first arrived. Strongly recommended! The 'Adriana' chalet was perfect for our two week stay in Seis. It is fully equipped, very comfortable for 2 couples and close to the centre of Seis. There is an excellent shuttle bus service from both the town centre and the gondola lift that drops you almost at your front door. Our host (Judith) was excellent. She responded very promptly to the couple of enquiries we had during the stay. Very modern and clean, host Judith was amazing. Would thoroughly recommend a stay. Wunderbares Chalet mit hochwertiger, komfortabler Ausstattung, sehr sauber und gepflegt! Das Haus befindet sich in ruhiger Lage am Rand von Seis mit tollem Blick auf die Berge. Ganz herzlicher Empfang durch die Eigentümerin, die sich viel Zeit nahm, alles zu erklären, und auch während des Aufenthalts jederzeit ansprechbar war (was wir aber nicht brauchten, da im Haus alles vorhanden war und einwandfrei funktionierte). Wir haben uns rundum wohl gefühlt und kommen sehr, sehr gerne wieder!